There are about 25,000 rhinos in all of Africa today. This number becomes more meaningful — and painful — when you consider rhinos’ former strength on the continent. Black rhinos once numbered in the hundreds of thousands, perhaps up to 850,000, while southern white rhinos were widespread in their range south of the Zambezi river. In the last few decades, the rhino species has suffered substantial losses. The western black rhino that once ranged in Cameroon and Chad was declared extinct in 2011, and the northern white rhino is at the brink of extinction with only one population of fewer than 10 individuals left. The escalating demand for rhino horn — especially in China, Vietnam, and other Asian countries — led to a dramatic poaching increase in southern Africa, fueled by poverty and poor wildlife management in the region. In 2007, poachers killed a total of 13 rhinos in South Africa, where most of Africa’s rhinos live. At the peak of the poaching crisis in 2014, that number was 1,215. By this time, the poaching syndicates had spread their operations to East Africa, decimating the region’s black rhino populations. Though concerted anti-poaching efforts have reduced the overall number of rhinos killed since the start of the crisis in 2008, the rate of illegal rhino killings has remained high for the last nine years with South Africa losing 1,028 rhinos in 2017. The stakes of rhino protection continue to escalate as poaching operations grow more sophisticated and habitat loss spreads across large wildlife-rich landscapes. At the height of the rhino poaching crisis African Wildlife Foundation, working with other conservation organizations and government authorities in selected rhino range states, responded with a strategy that tackled the various drivers of drastic population declines. Designed to stop the killing on the ground and also curb demand for illegal wildlife products, the measures also intercept traffickers and ensure that black-marketeers are prosecuted in accordance with relevant wildlife laws. We focused on critical rhino populations facing urgent threat, supporting wildlife protection agencies to maximize their anti-poaching impact. In the Tsavo landscape, black rhinos at the Ngulia Rhino Sanctuary and the surrounding buffer share a 90-sq.-km fenced-in area with other wildlife. 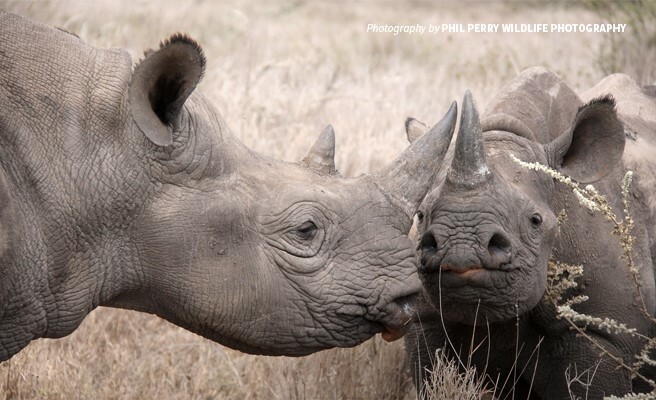 AWF has provided Kenya Wildlife Service with needed financial and technical support to safeguard the remaining rhinos. Apart from securing the sanctuary with fences, we also supplied ranger uniforms, camera traps, and other technology to enhance monitoring species’ numbers and threat levels. We also helped Ngulia make infrastructure improvements such as restoring a pump system that feeds reservoirs on the sanctuary. 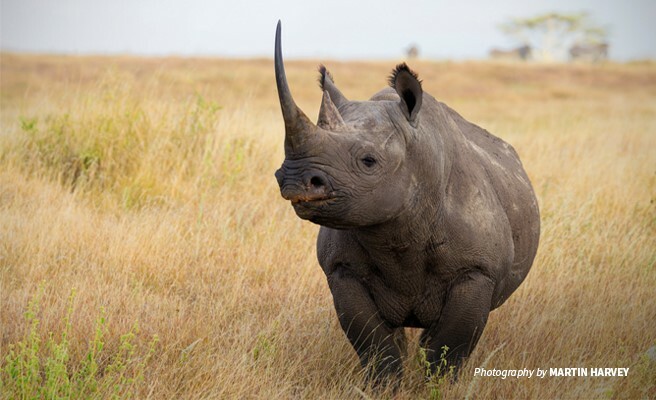 Likewise, AWF has facilitated equipment procurement and skills training for rangers at Ol Pejeta Conservancy, the largest and most significant black rhino sanctuary in East and Central Africa. Like all of the continent’s rhinos, the ones living in Ol Pejeta are increasingly under pressure. To maintain a healthy population, the mixed-use conservancy wanted to boost law enforcement, enhance biological management, and improve upon its monitoring efforts. AWF has helped the rhino team improve its monitoring and management capacity — including enhancing the accuracy of black rhino monitoring via ear notching. The ability to accurately identify all rhino reduces the opportunity for fraud based on misreported sightings and helps wildlife protection authorities detect the loss of rhino over time. AWF’s training of rangers in poaching-law enforcement and investigation helps ensure that poachers find no loopholes to evade prosecution for their crimes once they are caught. AWF also deploys trained sniffer dogs at transportation hubs in Kenya, Tanzania, and Uganda to ferret out contraband. The dog-and-handler teams have increased the detection of illegal wildlife products trafficked through these ports, making more than 260 finds of rhino horn and ivory to date. What fuels the demand for rhino horn? Many people who buy rhino horn use it in alternative medicine, even though rhino horn is made of keratin — the same material that is in our fingernails and toenails — and has zero medicinal value. Buyers also “use” rhino horns to display as trophies. AWF’s awareness campaigns continue to educate global audiences about the real cost of wildlife products, highlighting how many iconic species are already under threat from habitat fragmentation and human-wildlife conflict before they even cross paths with poachers and hunters. In Vietnam and China, awareness campaigns have increased public understanding about poaching, the vulnerability of rhinos as a species and the fact that rhino horn is not a valid medicine. 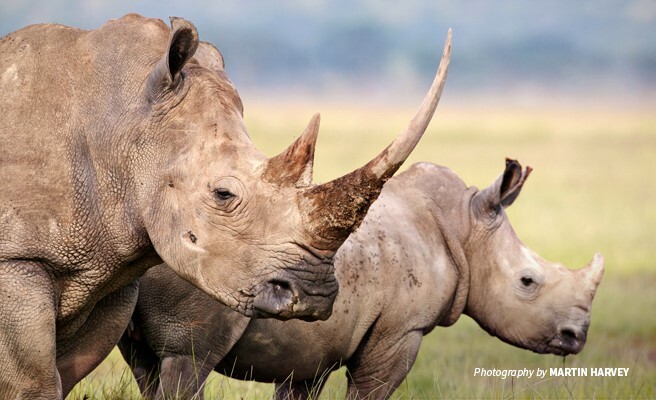 Following an awareness-building collaboration between AWF and WildAid, a consumer survey pointed to increased awareness about the devastating effects of rhino poaching, with 72 percent of respondents showing stronger intent not to buy rhino horn in the future. As AWF partners with international governments to stifle the dynamic markets of illegal wildlife products like rhino horn, efforts to build the anti-poaching capacity of wildlife authorities are also heightened to permanently end the slaughter of endangered wildlife. Of the 10 populations we support continent-wide, all are stable or increasing — but the fight for the rhino is not yet over.